Tracey Ullman had them down pat. 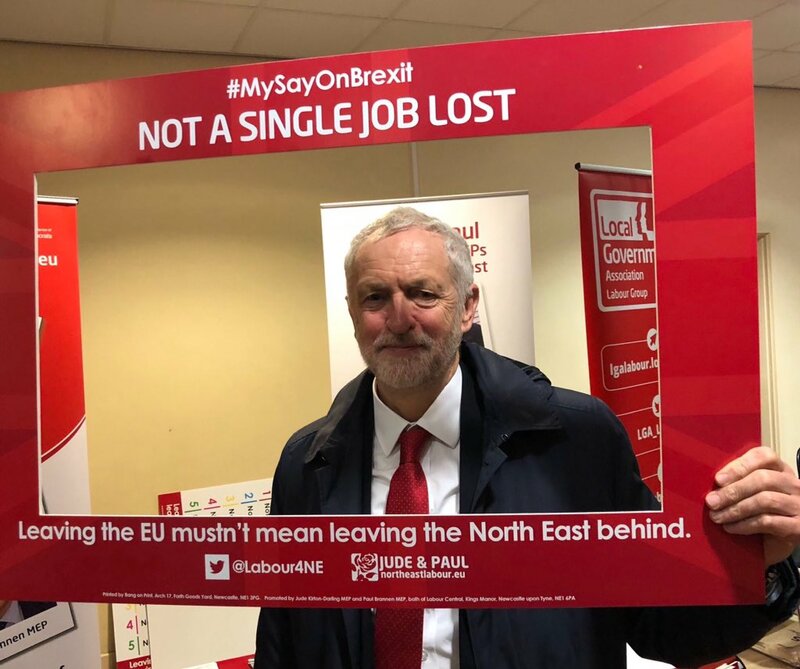 I bet we will not see Jezziah, posing for yet another cynical photo opportunity, whilst chatting to Jaguar workers about the Will of the People and his Jobs First BREXIT/LEXIT. We have heard a lot from the Cult of Corbyn about the Blessed Tony Benn, but he would have done, he did do, way better than this when he was Labour Shadow Secretary of State for Trade and Industry. He would have Tweeted something more than cliché to stop Greg Clark dead in his tracks. Tony Benn would have been up all night, assembling the information for when the next day he put down an Urgent Question to demand that Rt Hon Greg Clark, MP, Secretary of State for Business, Energy and Industrial Strategy come to the House of Commons to explain how his Government were planning to respond to job losses, like those at Jaguar. There is an important point here. 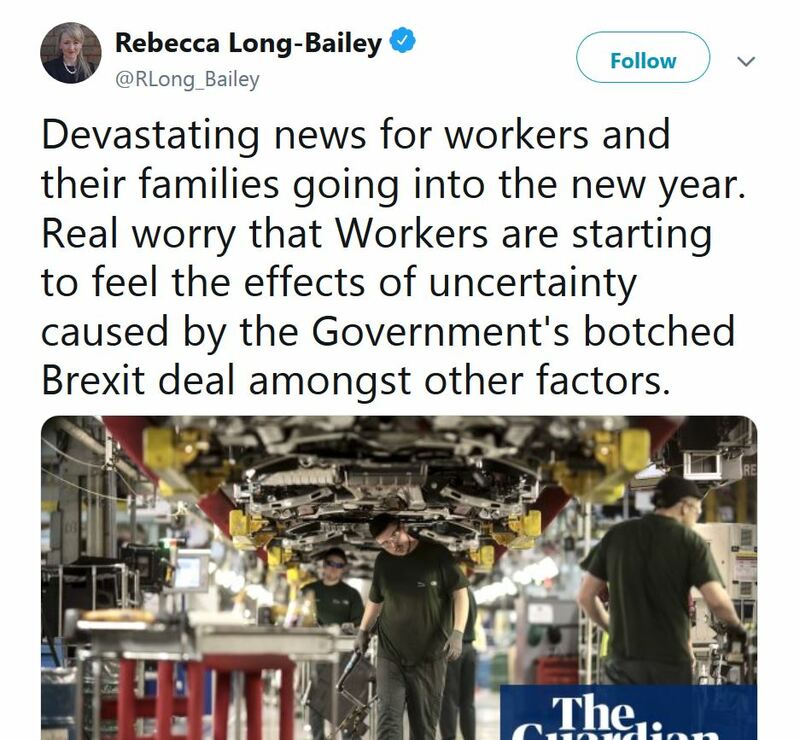 Those BREXIT/LEXIT supporting MPs are complicit in the jobs lost to date, those jobs now being lost and future job losses. Actions have consequences and if they back BREXIT, they should have called long ago for the Government to activate measures to help minimise the socio-economic consequences of BREXIT. But, instead, they have preferred to passionately debate abstract concepts like the Will of the People. Anything, but accept that Project Fear is now Project Reality for 5,000 fellow citizens. They are placing burdens on the narrowest shoulders. They are putting burdens on the People. Corbyn and Rees-Mogg are not Children of the People. They were not brought up amongst them. They do not know their trials. And yet they plan to add, immeasurably, to the anxieties which they expect the People and their Children to bear, uncomplaining, with patience and fortitude. Many cupboards will be barer than today. The lot of many will be harder than today. But rest assured, People, all will be well, bright and cheery chez Corbyn, atop McCluskey Towers and at Rees-Mogg Hall this Christmas and at Christmastides yet to come! They will not share the BREXIT/LEXIT burdens of the People. For the likes of Corbyn, McCluskey and Rees-Mogg, unemployment and poverty are things that happen to other people. The Will of the People will not put food on the Table of the People or console the 5,000 Jaguar workers (and how many other poor souls? ), now spending Christmas worrying about the prospect of being out of work, early in the New Year. In 2019, the Year of Unity and getting on with BREXIT/LEXIT! Jeremy Corbyn’s political career in a single sentence. With due apologies to David Lloyd George for a little plagiarism and adaptation. I am sure you would not DLG disapprove of a relative, in spirit, if not blood, taking such liberties at a time such as this? But we are so taken up and occupied with the good qualities of this saint Christmas, that we are keeping Mr. Pickwick and his friends waiting in the cold on the outside of the Muggleton coach, which they have just attained, well wrapped up in great- coats, shawls, and comforters. The portmanteaus and carpet- bags have been stowed away, and Mr. Weller and the guard are endeavouring to insinuate into the fore-boot a huge cod-fish several sizes too large for it–which is snugly packed up, in a long brown basket, with a layer of straw over the top, and which has been left to the last, in order that he may repose in safety on the half-dozen barrels of real native oysters, all the property of Mr. Pickwick, which have been arranged in regular order at the bottom of the receptacle. The interest displayed in Mr. Pickwick’s countenance is most intense, as Mr. Weller and the guard try to squeeze the cod-fish into the boot, first head first, and then tail first, and then top upward, and then bottom upward, and then side-ways, and then long-ways, all of which artifices the implacable cod-fish sturdily resists, until the guard accidentally hits him in the very middle of the basket, whereupon he suddenly disappears into the boot, and with him, the head and shoulders of the guard himself, who, not calculating upon so sudden a cessation of the passive resistance of the cod-fish, experiences a very unexpected shock, to the unsmotherable delight of all the porters and bystanders. Upon this, Mr. Pickwick smiles with great good-humour, and drawing a shilling from his waistcoat pocket, begs the guard, as he picks himself out of the boot, to drink his health in a glass of hot brandy-and-water; at which the guard smiles too, and Messrs. Snodgrass, Winkle, and Tupman, all smile in company. The guard and Mr. Weller disappear for five minutes, most probably to get the hot brandy-and-water, for they smell very strongly of it, when they return, the coachman mounts to the box, Mr. Weller jumps up behind, the Pickwickians pull their coats round their legs and their shawls over their noses, the helpers pull the horse-cloths off, the coachman shouts out a cheery ‘All right,’ and away they go. They have rumbled through the streets, and jolted over the stones, and at length reach the wide and open country. The wheels skim over the hard and frosty ground; and the horses, bursting into a canter at a smart crack of the whip, step along the road as if the load behind them–coach, passengers, cod-fish, oyster-barrels, and all–were but a feather at their heels. They have descended a gentle slope, and enter upon a level, as compact and dry as a solid block of marble, two miles long. Another crack of the whip, and on they speed, at a smart gallop, the horses tossing their heads and rattling the harness, as if in exhilaration at the rapidity of the motion; while the coachman, holding whip and reins in one hand, takes off his hat with the other, and resting it on his knees, pulls out his handkerchief, and wipes his forehead, partly because he has a habit of doing it, and partly because it’s as well to show the passengers how cool he is, and what an easy thing it is to drive four-in-hand, when you have had as much practice as he has. Having done this very leisurely (otherwise the effect would be materially impaired), he replaces his handkerchief, pulls on his hat, adjusts his gloves, squares his elbows, cracks the whip again, and on they speed, more merrily than before. A few small houses, scattered on either side of the road, betoken the entrance to some town or village. The lively notes of the guard’s key-bugle vibrate in the clear cold air, and wake up the old gentleman inside, who, carefully letting down the window-sash half-way, and standing sentry over the air, takes a short peep out, and then carefully pulling it up again, informs the other inside that they’re going to change directly; on which the other inside wakes himself up, and determines to postpone his next nap until after the stoppage. Again the bugle sounds lustily forth, and rouses the cottager’s wife and children, who peep out at the house door, and watch the coach till it turns the corner, when they once more crouch round the blazing fire, and throw on another log of wood against father comes home; while father himself, a full mile off, has just exchanged a friendly nod with the coachman, and turned round to take a good long stare at the vehicle as it whirls away. And now the bugle plays a lively air as the coach rattles through the ill-paved streets of a country town; and the coachman, undoing the buckle which keeps his ribands together, prepares to throw them off the moment he stops. Mr. Pickwick emerges from his coat collar, and looks about him with great curiosity; perceiving which, the coachman informs Mr. Pickwick of the name of the town, and tells him it was market-day yesterday, both of which pieces of information Mr. Pickwick retails to his fellow-passengers; whereupon they emerge from their coat collars too, and look about them also. Mr. Winkle, who sits at the extreme edge, with one leg dangling in the air, is nearly precipitated into the street, as the coach twists round the sharp corner by the cheesemonger’s shop, and turns into the market- place; and before Mr. Snodgrass, who sits next to him, has recovered from his alarm, they pull up at the inn yard where the fresh horses, with cloths on, are already waiting. The coachman throws down the reins and gets down himself, and the other outside passengers drop down also; except those who have no great confidence in their ability to get up again; and they remain where they are, and stamp their feet against the coach to warm them–looking, with longing eyes and red noses, at the bright fire in the inn bar, and the sprigs of holly with red berries which ornament the window. But the guard has delivered at the corn-dealer’s shop, the brown paper packet he took out of the little pouch which hangs over his shoulder by a leathern strap; and has seen the horses carefully put to; and has thrown on the pavement the saddle which was brought from London on the coach roof; and has assisted in the conference between the coachman and the hostler about the gray mare that hurt her off fore-leg last Tuesday; and he and Mr. Weller are all right behind, and the coachman is all right in front, and the old gentleman inside, who has kept the window down full two inches all this time, has pulled it up again, and the cloths are off, and they are all ready for starting, except the ‘two stout gentlemen,’ whom the coachman inquires after with some impatience. Hereupon the coachman, and the guard, and Sam Weller, and Mr. Winkle, and Mr. Snodgrass, and all the hostlers, and every one of the idlers, who are more in number than all the others put together, shout for the missing gentlemen as loud as they can bawl. A distant response is heard from the yard, and Mr. Pickwick and Mr. Tupman come running down it, quite out of breath, for they have been having a glass of ale a-piece, and Mr. Pickwick’s fingers are so cold that he has been full five minutes before he could find the sixpence to pay for it. The coachman shouts an admonitory ‘Now then, gen’l’m’n,’ the guard re-echoes it; the old gentleman inside thinks it a very extraordinary thing that people will get down when they know there isn’t time for it; Mr. Pickwick struggles up on one side, Mr. Tupman on the other; Mr. Winkle cries ‘All right’; and off they start. Shawls are pulled up, coat collars are readjusted, the pavement ceases, the houses disappear; and they are once again dashing along the open road, with the fresh clear air blowing in their faces, and gladdening their very hearts within them. Such was the progress of Mr. Pickwick and his friends by the Muggleton Telegraph, on their way to Dingley Dell; and at three o’clock that afternoon they all stood high and dry, safe and sound, hale and hearty, upon the steps of the Blue Lion, having taken on the road quite enough of ale and brandy, to enable them to bid defiance to the frost that was binding up the earth in its iron fetters, and weaving its beautiful network upon the trees and hedges. Mr. Pickwick was busily engaged in counting the barrels of oysters and superintending the disinterment of the cod-fish, when he felt himself gently pulled by the skirts of the coat. Looking round, he discovered that the individual who resorted to this mode of catching his attention was no other than Mr. Wardle’s favourite page, better known to the readers of this unvarnished history, by the distinguishing appellation of the fat boy. ‘Aha!’ said the fat boy. As he said it, he glanced from the cod-fish to the oyster- barrels, and chuckled joyously. He was fatter than ever. ‘Well, you look rosy enough, my young friend,’ said Mr. Pickwick. ‘Thank’ee,’ said the fat boy. ‘You ain’t got nothin’ on your mind as makes you fret yourself, have you?’ inquired Sam. ‘Not as I knows on,’ replied the fat boy. ‘I should rayther ha’ thought, to look at you, that you was a-labourin’ under an unrequited attachment to some young ‘ooman,’ said Sam. ‘I likes eating better,’ replied the boy. The Blue Lion tap was soon gained, and the fat boy swallowed a glass of liquor without so much as winking–a feat which considerably advanced him in Mr. Weller’s good opinion. Mr. Weller having transacted a similar piece of business on his own account, they got into the cart. ‘Can you drive?’ said the fat boy. ‘I should rayther think so,’ replied Sam. With these words, the fat boy laid himself affectionately down by the side of the cod-fish, and, placing an oyster-barrel under his head for a pillow, fell asleep instantaneously. But as young dropsy evinced no symptoms of returning animation, Sam Weller sat himself down in front of the cart, and starting the old horse with a jerk of the rein, jogged steadily on, towards the Manor Farm. Meanwhile, Mr. Pickwick and his friends having walked their blood into active circulation, proceeded cheerfully on. The paths were hard; the grass was crisp and frosty; the air had a fine, dry, bracing coldness; and the rapid approach of the gray twilight (slate-coloured is a better term in frosty weather) made them look forward with pleasant anticipation to the comforts which awaited them at their hospitable entertainer’s. It was the sort of afternoon that might induce a couple of elderly gentlemen, in a lonely field, to take off their greatcoats and play at leap-frog in pure lightness of heart and gaiety; and we firmly believe that had Mr. Tupman at that moment proffered ‘a back,’ Mr. Pickwick would have accepted his offer with the utmost avidity. However, Mr. Tupman did not volunteer any such accommodation, and the friends walked on, conversing merrily. As they turned into a lane they had to cross, the sound of many voices burst upon their ears; and before they had even had time to form a guess to whom they belonged, they walked into the very centre of the party who were expecting their arrival–a fact which was first notified to the Pickwickians, by the loud ‘Hurrah,’ which burst from old Wardle’s lips, when they appeared in sight. First, there was Wardle himself, looking, if that were possible, more jolly than ever; then there were Bella and her faithful Trundle; and, lastly, there were Emily and some eight or ten young ladies, who had all come down to the wedding, which was to take place next day, and who were in as happy and important a state as young ladies usually are, on such momentous occasions; and they were, one and all, startling the fields and lanes, far and wide, with their frolic and laughter. The ceremony of introduction, under such circumstances, was very soon performed, or we should rather say that the introduction was soon over, without any ceremony at all. In two minutes thereafter, Mr. Pickwick was joking with the young ladies who wouldn’t come over the stile while he looked–or who, having pretty feet and unexceptionable ankles, preferred standing on the top rail for five minutes or so, declaring that they were too frightened to move–with as much ease and absence of reserve or constraint, as if he had known them for life. It is worthy of remark, too, that Mr. Snodgrass offered Emily far more assistance than the absolute terrors of the stile (although it was full three feet high, and had only a couple of stepping-stones) would seem to require; while one black-eyed young lady in a very nice little pair of boots with fur round the top, was observed to scream very loudly, when Mr. Winkle offered to help her over. All this was very snug and pleasant. And when the difficulties of the stile were at last surmounted, and they once more entered on the open field, old Wardle informed Mr. Pickwick how they had all been down in a body to inspect the furniture and fittings- up of the house, which the young couple were to tenant, after the Christmas holidays; at which communication Bella and Trundle both coloured up, as red as the fat boy after the taproom fire; and the young lady with the black eyes and the fur round the boots, whispered something in Emily’s ear, and then glanced archly at Mr. Snodgrass; to which Emily responded that she was a foolish girl, but turned very red, notwithstanding; and Mr. Snodgrass, who was as modest as all great geniuses usually are, felt the crimson rising to the crown of his head, and devoutly wished, in the inmost recesses of his own heart, that the young lady aforesaid, with her black eyes, and her archness, and her boots with the fur round the top, were all comfortably deposited in the adjacent county. But if they were social and happy outside the house, what was the warmth and cordiality of their reception when they reached the farm! The very servants grinned with pleasure at sight of Mr. Pickwick; and Emma bestowed a half-demure, half-impudent, and all-pretty look of recognition, on Mr. Tupman, which was enough to make the statue of Bonaparte in the passage, unfold his arms, and clasp her within them. The old lady was seated with customary state in the front parlour, but she was rather cross, and, by consequence, most particularly deaf. She never went out herself, and like a great many other old ladies of the same stamp, she was apt to consider it an act of domestic treason, if anybody else took the liberty of doing what she couldn’t. So, bless her old soul, she sat as upright as she could, in her great chair, and looked as fierce as might be –and that was benevolent after all. ‘Never mind,’ replied the old lady, with great dignity. ‘Don’t trouble Mr. Pickwick about an old creetur like me. Nobody cares about me now, and it’s very nat’ral they shouldn’t.’ Here the old lady tossed her head, and smoothed down her lavender-coloured silk dress with trembling hands. ‘No doubt of that, ma’am,’ said Mr. Pickwick, ‘and that’s the reason why I would make much of the few that have any traces of the old stock’–and saying this, Mr. Pickwick gently pulled Bella towards him, and bestowing a kiss upon her forehead, bade her sit down on the little stool at her grandmother’s feet. Whether the expression of her countenance, as it was raised towards the old lady’s face, called up a thought of old times, or whether the old lady was touched by Mr. Pickwick’s affectionate good-nature, or whatever was the cause, she was fairly melted; so she threw herself on her granddaughter’s neck, and all the little ill-humour evaporated in a gush of silent tears. A happy party they were, that night. Sedate and solemn were the score of rubbers in which Mr. Pickwick and the old lady played together; uproarious was the mirth of the round table. Long after the ladies had retired, did the hot elder wine, well qualified with brandy and spice, go round, and round, and round again; and sound was the sleep and pleasant were the dreams that followed. It is a remarkable fact that those of Mr. Snodgrass bore constant reference to Emily Wardle; and that the principal figure in Mr. Winkle’s visions was a young lady with black eyes, and arch smile, and a pair of remarkably nice boots with fur round the tops. Mr. Pickwick was awakened early in the morning, by a hum of voices and a pattering of feet, sufficient to rouse even the fat boy from his heavy slumbers. He sat up in bed and listened. The female servants and female visitors were running constantly to and fro; and there were such multitudinous demands for hot water, such repeated outcries for needles and thread, and so many half-suppressed entreaties of ‘Oh, do come and tie me, there’s a dear!’ that Mr. Pickwick in his innocence began to imagine that something dreadful must have occurred–when he grew more awake, and remembered the wedding. The occasion being an important one, he dressed himself with peculiar care, and descended to the breakfast-room. There were all the female servants in a bran new uniform of pink muslin gowns with white bows in their caps, running about the house in a state of excitement and agitation which it would be impossible to describe. The old lady was dressed out in a brocaded gown, which had not seen the light for twenty years, saving and excepting such truant rays as had stolen through the chinks in the box in which it had been laid by, during the whole time. Mr. Trundle was in high feather and spirits, but a little nervous withal. The hearty old landlord was trying to look very cheerful and unconcerned, but failing signally in the attempt. All the girls were in tears and white muslin, except a select two or three, who were being honoured with a private view of the bride and bridesmaids, upstairs. All the Pickwickians were in most blooming array; and there was a terrific roaring on the grass in front of the house, occasioned by all the men, boys, and hobbledehoys attached to the farm, each of whom had got a white bow in his button-hole, and all of whom were cheering with might and main; being incited thereto, and stimulated therein by the precept and example of Mr. Samuel Weller, who had managed to become mighty popular already, and was as much at home as if he had been born on the land. A wedding is a licensed subject to joke upon, but there really is no great joke in the matter after all;–we speak merely of the ceremony, and beg it to be distinctly understood that we indulge in no hidden sarcasm upon a married life. Mixed up with the pleasure and joy of the occasion, are the many regrets at quitting home, the tears of parting between parent and child, the consciousness of leaving the dearest and kindest friends of the happiest portion of human life, to encounter its cares and troubles with others still untried and little known–natural feelings which we would not render this chapter mournful by describing, and which we should be still more unwilling to be supposed to ridicule. Let us briefly say, then, that the ceremony was performed by the old clergyman, in the parish church of Dingley Dell, and that Mr. Pickwick’s name is attached to the register, still preserved in the vestry thereof; that the young lady with the black eyes signed her name in a very unsteady and tremulous manner; that Emily’s signature, as the other bridesmaid, is nearly illegible; that it all went off in very admirable style; that the young ladies generally thought it far less shocking than they had expected; and that although the owner of the black eyes and the arch smile informed Mr. Wardle that she was sure she could never submit to anything so dreadful, we have the very best reasons for thinking she was mistaken. To all this, we may add, that Mr. Pickwick was the first who saluted the bride, and that in so doing he threw over her neck a rich gold watch and chain, which no mortal eyes but the jeweller’s had ever beheld before. Then, the old church bell rang as gaily as it could, and they all returned to breakfast. ‘Vere does the mince-pies go, young opium-eater?’ said Mr. Weller to the fat boy, as he assisted in laying out such articles of consumption as had not been duly arranged on the previous night. As Mr. Weller made the comparison, he fell back a step or two, to give full effect to it, and surveyed the preparations with the utmost satisfaction. ‘No, I ain’t, sir,’ replied the fat boy, starting up from a remote corner, where, like the patron saint of fat boys–the immortal Horner–he had been devouring a Christmas pie, though not with the coolness and deliberation which characterised that young gentleman’s proceedings. The fat boy filled Mr. Pickwick’s glass, and then retired behind his master’s chair, from whence he watched the play of the knives and forks, and the progress of the choice morsels from the dishes to the mouths of the company, with a kind of dark and gloomy joy that was most impressive. ‘God bless you, old fellow!’ said Mr. Pickwick. ‘Same to you, my boy,’ replied Wardle; and they pledged each other, heartily. The old lady was in a state of great grandeur just then, for she was sitting at the top of the table in the brocaded gown, with her newly-married granddaughter on one side, and Mr. Pickwick on the other, to do the carving. Mr. Pickwick had not spoken in a very loud tone, but she understood him at once, and drank off a full glass of wine to his long life and happiness; after which the worthy old soul launched forth into a minute and particular account of her own wedding, with a dissertation on the fashion of wearing high-heeled shoes, and some particulars concerning the life and adventures of the beautiful Lady Tollimglower, deceased; at all of which the old lady herself laughed very heartily indeed, and so did the young ladies too, for they were wondering among themselves what on earth grandma was talking about. When they laughed, the old lady laughed ten times more heartily, and said that these always had been considered capital stories, which caused them all to laugh again, and put the old lady into the very best of humours. Then the cake was cut, and passed through the ring; the young ladies saved pieces to put under their pillows to dream of their future husbands on; and a great deal of blushing and merriment was thereby occasioned. ‘With great satisfaction, Mr. Pickwick,’ replied the hard- headed gentleman solemnly. ‘You’ll take me in?’ said the benevolent old clergyman. ‘And me,’ interposed his wife. ‘And me, and me,’ said a couple of poor relations at the bottom of the table, who had eaten and drunk very heartily, and laughed at everything. Mr. Pickwick expressed his heartfelt delight at every additional suggestion; and his eyes beamed with hilarity and cheerfulness. ‘Ladies and gentlemen,’ said Mr. Pickwick, suddenly rising. ‘Hear, hear! Hear, hear! Hear, hear!’ cried Mr. Weller, in the excitement of his feelings. Mr. Pickwick concluded amidst a whirlwind of applause; and once more were the lungs of the supernumeraries, under Mr. Weller’s command, brought into active and efficient operation. Mr. Wardle proposed Mr. Pickwick; Mr. Pickwick proposed the old lady. Mr. Snodgrass proposed Mr. Wardle; Mr. Wardle proposed Mr. Snodgrass. One of the poor relations proposed Mr. Tupman, and the other poor relation proposed Mr. Winkle; all was happiness and festivity, until the mysterious disappearance of both the poor relations beneath the table, warned the party that it was time to adjourn. At dinner they met again, after a five-and-twenty mile walk, undertaken by the males at Wardle’s recommendation, to get rid of the effects of the wine at breakfast. The poor relations had kept in bed all day, with the view of attaining the same happy consummation, but, as they had been unsuccessful, they stopped there. Mr. Weller kept the domestics in a state of perpetual hilarity; and the fat boy divided his time into small alternate allotments of eating and sleeping. The dinner was as hearty an affair as the breakfast, and was quite as noisy, without the tears. Then came the dessert and some more toasts. Then came the tea and coffee; and then, the ball. The best sitting-room at Manor Farm was a good, long, dark- panelled room with a high chimney-piece, and a capacious chimney, up which you could have driven one of the new patent cabs, wheels and all. At the upper end of the room, seated in a shady bower of holly and evergreens were the two best fiddlers, and the only harp, in all Muggleton. In all sorts of recesses, and on all kinds of brackets, stood massive old silver candlesticks with four branches each. The carpet was up, the candles burned bright, the fire blazed and crackled on the hearth, and merry voices and light-hearted laughter rang through the room. If any of the old English yeomen had turned into fairies when they died, it was just the place in which they would have held their revels. If anything could have added to the interest of this agreeable scene, it would have been the remarkable fact of Mr. Pickwick’s appearing without his gaiters, for the first time within the memory of his oldest friends. ‘You mean to dance?’ said Wardle. ‘Of course I do,’ replied Mr. Pickwick. ‘Don’t you see I am dressed for the purpose?’ Mr. Pickwick called attention to his speckled silk stockings, and smartly tied pumps. ‘You in silk stockings!’ exclaimed Mr. Tupman jocosely. ‘And why not, sir–why not?’ said Mr. Pickwick, turning warmly upon him. ‘Oh, of course there is no reason why you shouldn’t wear them,’ responded Mr. Tupman. ‘I imagine not, sir–I imagine not,’ said Mr. Pickwick, in a very peremptory tone. Mr. Tupman had contemplated a laugh, but he found it was a serious matter; so he looked grave, and said they were a pretty pattern. ‘Certainly not. Oh, certainly not,’ replied Mr. Tupman. He walked away; and Mr. Pickwick’s countenance resumed its customary benign expression. 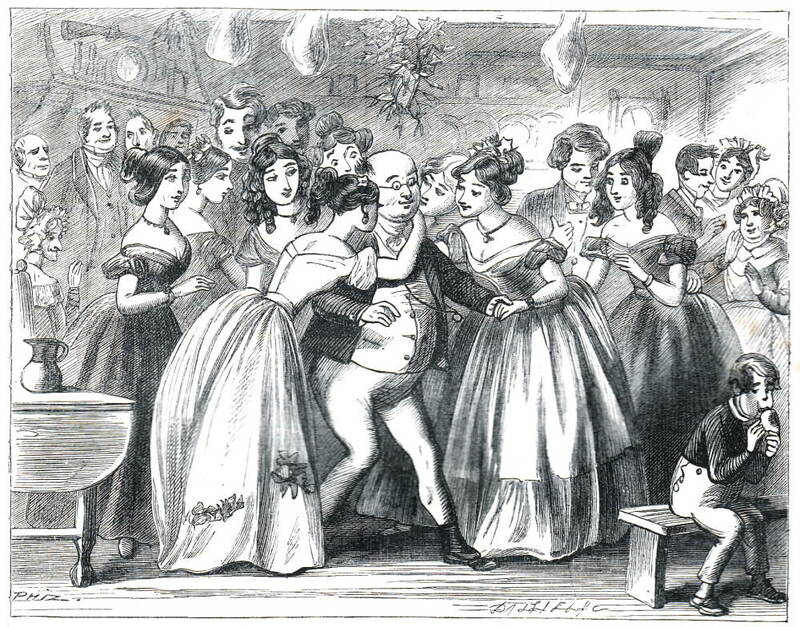 ‘We are all ready, I believe,’ said Mr. Pickwick, who was stationed with the old lady at the top of the dance, and had already made four false starts, in his excessive anxiety to commence. ‘What’s the matter?’ said Mr. Pickwick, who was only brought to, by the fiddles and harp desisting, and could have been stopped by no other earthly power, if the house had been on fire. ‘Where’s Arabella Allen?’ cried a dozen voices. ‘Here we are!’ exclaimed that gentleman, emerging with his pretty companion from the corner; as he did so, it would have been hard to tell which was the redder in the face, he or the young lady with the black eyes. ‘Not at all extraordinary,’ said Mr. Winkle. However, there was no time to think more about the matter, for the fiddles and harp began in real earnest. Away went Mr. Pickwick–hands across–down the middle to the very end of the room, and half-way up the chimney, back again to the door– poussette everywhere–loud stamp on the ground–ready for the next couple–off again–all the figure over once more–another stamp to beat out the time–next couple, and the next, and the next again–never was such going; at last, after they had reached the bottom of the dance, and full fourteen couple after the old lady had retired in an exhausted state, and the clergyman’s wife had been substituted in her stead, did that gentleman, when there was no demand whatever on his exertions, keep perpetually dancing in his place, to keep time to the music, smiling on his partner all the while with a blandness of demeanour which baffles all description. Long before Mr. Pickwick was weary of dancing, the newly- married couple had retired from the scene. There was a glorious supper downstairs, notwithstanding, and a good long sitting after it; and when Mr. Pickwick awoke, late the next morning, he had a confused recollection of having, severally and confidentially, invited somewhere about five-and-forty people to dine with him at the George and Vulture, the very first time they came to London; which Mr. Pickwick rightly considered a pretty certain indication of his having taken something besides exercise, on the previous night. ‘And so your family has games in the kitchen to-night, my dear, has they?’ inquired Sam of Emma. ‘Oh, that he is!’ said the fat boy, joining in the conversation; ‘don’t he breed nice pork!’ The fat youth gave a semi-cannibalic leer at Mr. Weller, as he thought of the roast legs and gravy. ‘Oh, you’ve woke up, at last, have you?’ said Sam. ‘What did they do to him?’ inquired the fat boy, in a faltering voice. As Mr. Weller concluded this moral tale, with which the fat boy appeared much affected, they all three repaired to the large kitchen, in which the family were by this time assembled, according to annual custom on Christmas Eve, observed by old Wardle’s forefathers from time immemorial. 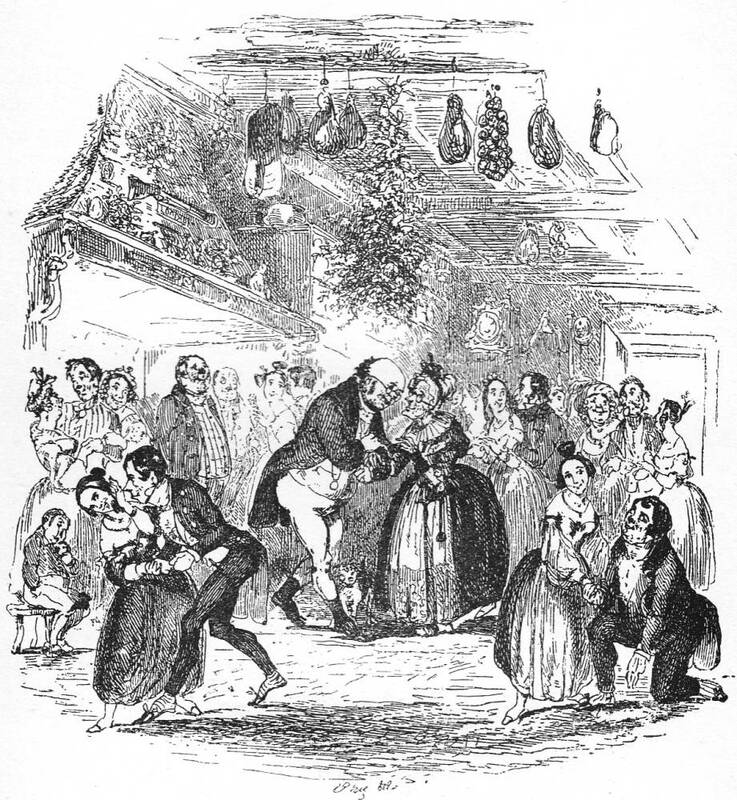 From the centre of the ceiling of this kitchen, old Wardle had just suspended, with his own hands, a huge branch of mistletoe, and this same branch of mistletoe instantaneously gave rise to a scene of general and most delightful struggling and confusion; in the midst of which, Mr. Pickwick, with a gallantry that would have done honour to a descendant of Lady Tollimglower herself, took the old lady by the hand, led her beneath the mystic branch, and saluted her in all courtesy and decorum. The old lady submitted to this piece of practical politeness with all the dignity which befitted so important and serious a solemnity, but the younger ladies, not being so thoroughly imbued with a superstitious veneration for the custom, or imagining that the value of a salute is very much enhanced if it cost a little trouble to obtain it, screamed and struggled, and ran into corners, and threatened and remonstrated, and did everything but leave the room, until some of the less adventurous gentlemen were on the point of desisting, when they all at once found it useless to resist any longer, and submitted to be kissed with a good grace. Mr. Winkle kissed the young lady with the black eyes, and Mr. Snodgrass kissed Emily; and Mr. Weller, not being particular about the form of being under the mistletoe, kissed Emma and the other female servants, just as he caught them. As to the poor relations, they kissed everybody, not even excepting the plainer portions of the young lady visitors, who, in their excessive confusion, ran right under the mistletoe, as soon as it was hung up, without knowing it! Wardle stood with his back to the fire, surveying the whole scene, with the utmost satisfaction; and the fat boy took the opportunity of appropriating to his own use, and summarily devouring, a particularly fine mince-pie, that had been carefully put by, for somebody else. Now, the screaming had subsided, and faces were in a glow, and curls in a tangle, and Mr. Pickwick, after kissing the old lady as before mentioned, was standing under the mistletoe, looking with a very pleased countenance on all that was passing around him, when the young lady with the black eyes, after a little whispering with the other young ladies, made a sudden dart forward, and, putting her arm round Mr. Pickwick’s neck, saluted him affectionately on the left cheek; and before Mr. Pickwick distinctly knew what was the matter, he was surrounded by the whole body, and kissed by every one of them. It was a pleasant thing to see Mr. Pickwick in the centre of the group, now pulled this way, and then that, and first kissed on the chin, and then on the nose, and then on the spectacles, and to hear the peals of laughter which were raised on every side; but it was a still more pleasant thing to see Mr. Pickwick, blinded shortly afterwards with a silk handkerchief, falling up against the wall, and scrambling into corners, and going through all the mysteries of blind-man’s buff, with the utmost relish for the game, until at last he caught one of the poor relations, and then had to evade the blind-man himself, which he did with a nimbleness and agility that elicited the admiration and applause of all beholders. The poor relations caught the people who they thought would like it, and, when the game flagged, got caught themselves. When they all tired of blind-man’s buff, there was a great game at snap-dragon, and when fingers enough were burned with that, and all the raisins were gone, they sat down by the huge fire of blazing logs to a substantial supper, and a mighty bowl of wassail, something smaller than an ordinary wash- house copper, in which the hot apples were hissing and bubbling with a rich look, and a jolly sound, that were perfectly irresistible. Up flew the bright sparks in myriads as the logs were stirred. The deep red blaze sent forth a rich glow, that penetrated into the farthest corner of the room, and cast its cheerful tint on every face. This song was tumultuously applauded–for friends and dependents make a capital audience–and the poor relations, especially, were in perfect ecstasies of rapture. Again was the fire replenished, and again went the wassail round. ‘How it snows!’ said one of the men, in a low tone. ‘Snows, does it?’ said Wardle. ‘The story about what?’ said Mr. Pickwick. But bless our editorial heart, what a long chapter we have been betrayed into! We had quite forgotten all such petty restrictions as chapters, we solemnly declare. So here goes, to give the goblin a fair start in a new one. A clear stage and no favour for the goblins, ladies and gentlemen, if you please. `It looks as if we were coming to a village,’ said the Mole somewhat dubiously, slackening his pace, as the track, that had in time become a path and then had developed into a lane, now handed them over to the charge of a well-metalled road. The animals did not hold with villages, and their own highways, thickly frequented as they were, took an independent course, regardless of church, post office, or public-house. The rapid nightfall of mid-December had quite beset the little village as they approached it on soft feet over a first thin fall of powdery snow. Little was visible but squares of a dusky orange-red on either side of the street, where the firelight or lamplight of each cottage overflowed through the casements into the dark world without. Most of the low latticed windows were innocent of blinds, and to the lookers-in from outside, the inmates, gathered round the tea-table, absorbed in handiwork, or talking with laughter and gesture, had each that happy grace which is the last thing the skilled actor shall capture–the natural grace which goes with perfect unconsciousness of observation. Moving at will from one theatre to another, the two spectators, so far from home themselves, had something of wistfulness in their eyes as they watched a cat being stroked, a sleepy child picked up and huddled off to bed, or a tired man stretch and knock out his pipe on the end of a smouldering log. But it was from one little window, with its blind drawn down, a mere blank transparency on the night, that the sense of home and the little curtained world within walls–the larger stressful world of outside Nature shut out and forgotten–most pulsated. Close against the white blind hung a bird-cage, clearly silhouetted, every wire, perch, and appurtenance distinct and recognisable, even to yesterday’s dull-edged lump of sugar. On the middle perch the fluffy occupant, head tucked well into feathers, seemed so near to them as to be easily stroked, had they tried; even the delicate tips of his plumped-out plumage pencilled plainly on the illuminated screen. As they looked, the sleepy little fellow stirred uneasily, woke, shook himself, and raised his head. They could see the gape of his tiny beak as he yawned in a bored sort of way, looked round, and then settled his head into his back again, while the ruffled feathers gradually subsided into perfect stillness. Then a gust of bitter wind took them in the back of the neck, a small sting of frozen sleet on the skin woke them as from a dream, and they knew their toes to be cold and their legs tired, and their own home distant a weary way. We others, who have long lost the more subtle of the physical senses, have not even proper terms to express an animal’s inter- communications with his surroundings, living or otherwise, and have only the word `smell,’ for instance, to include the whole range of delicate thrills which murmur in the nose of the animal night and day, summoning, warning? inciting, repelling. It was one of these mysterious fairy calls from out the void that suddenly reached Mole in the darkness, making him tingle through and through with its very familiar appeal, even while yet he could not clearly remember what it was. He stopped dead in his tracks, his nose searching hither and thither in its efforts to recapture the fine filament, the telegraphic current, that had so strongly moved him. A moment, and he had caught it again; and with it this time came recollection in fullest flood. `Oh, come along, Mole, do!’ replied the Rat cheerfully, still plodding along. The Rat was by this time very far ahead, too far to hear clearly what the Mole was calling, too far to catch the sharp note of painful appeal in his voice. And he was much taken up with the weather, for he too could smell something–something suspiciously like approaching snow. `Mole, we mustn’t stop now, really!’ he called back. 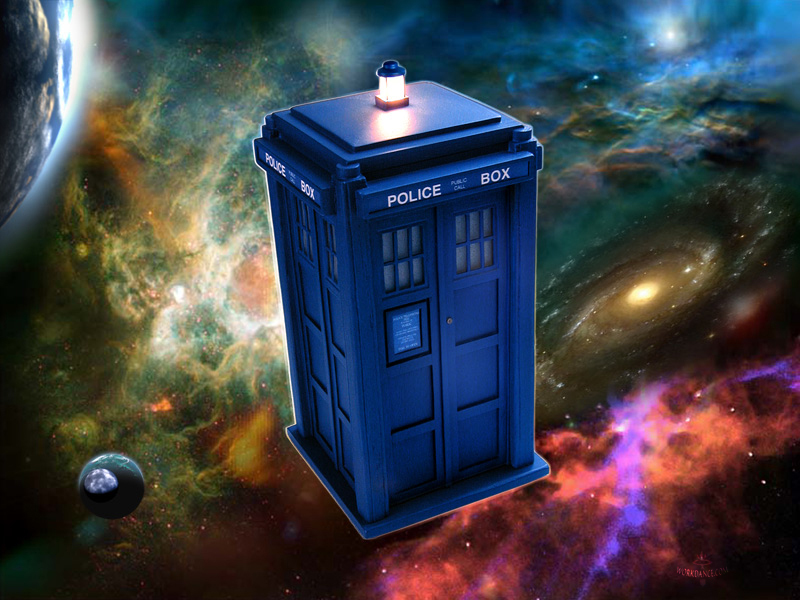 `We’ll come for it to-morrow, whatever it is you’ve found. But I daren’t stop now–it’s late, and the snow’s coming on again, and I’m not sure of the way! And I want your nose, Mole, so come on quick, there’s a good fellow!’ And the Rat pressed forward on his way without waiting for an answer. He waited till Mole’s sobs became gradually less stormy and more rhythmical; he waited till at last sniffs were frequent and sobs only intermittent. Then he rose from his seat, and, remarking carelessly, `Well, now we’d really better be getting on, old chap!’ set off up the road again, over the toilsome way they had come. 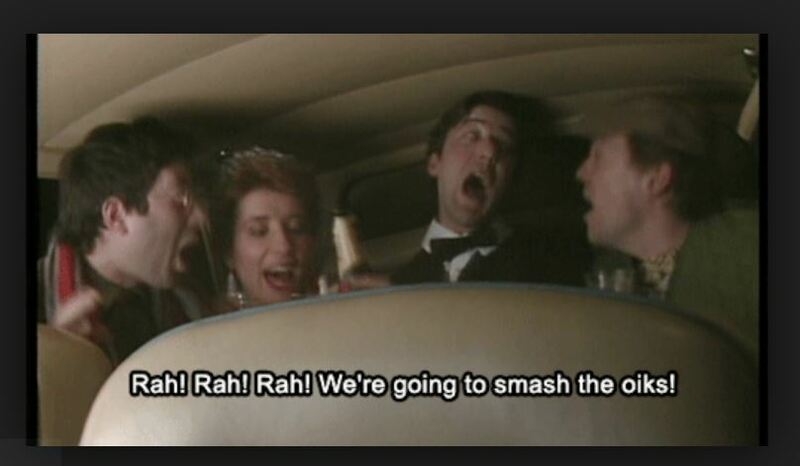 `Wherever are you (hic) going to (hic), Ratty?’ cried the tearful Mole, looking up in alarm. Then a short, quick run forward–a fault–a check–a try back; and then a slow, steady, confident advance. It was close and airless, and the earthy smell was strong, and it seemed a long time to Rat ere the passage ended and he could stand erect and stretch and shake himself. The Mole struck a match, and by its light the Rat saw that they were standing in an open space, neatly swept and sanded underfoot, and directly facing them was Mole’s little front door, with `Mole End’ painted, in Gothic lettering, over the bell-pull at the side. Mole reached down a lantern from a nail on the wail and lit it, and the Rat, looking round him, saw that they were in a sort of fore-court. A garden-seat stood on one side of the door, and on the other a roller; for the Mole, who was a tidy animal when at home, could not stand having his ground kicked up by other animals into little runs that ended in earth-heaps. On the walls hung wire baskets with ferns in them, alternating with brackets carrying plaster statuary–Garibaldi, and the infant Samuel, and Queen Victoria, and other heroes of modern Italy. Down on one side of the forecourt ran a skittle-alley, with benches along it and little wooden tables marked with rings that hinted at beer- mugs. In the middle was a small round pond containing gold-fish and surrounded by a cockle-shell border. Out of the centre of the pond rose a fanciful erection clothed in more cockle-shells and topped by a large silvered glass ball that reflected everything all wrong and had a very pleasing effect. They went and foraged accordingly, hunting through every cupboard and turning out every drawer. The result was not so very depressing after all, though of course it might have been better; a tin of sardines–a box of captain’s biscuits, nearly full–and a German sausage encased in silver paper. 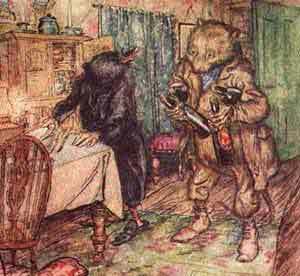 Then, while the Rat busied himself fetching plates, and knives and forks, and mustard which he mixed in an egg-cup, the Mole, his bosom still heaving with the stress of his recent emotion, related–somewhat shyly at first, but with more freedom as he warmed to his subject–how this was planned, and how that was thought out, and how this was got through a windfall from an aunt, and that was a wonderful find and a bargain, and this other thing was bought out of laborious savings and a certain amount of `going without.’ His spirits finally quite restored, he must needs go and caress his possessions, and take a lamp and show off their points to his visitor and expatiate on them, quite forgetful of the supper they both so much needed; Rat, who was desperately hungry but strove to conceal it, nodding seriously, examining with a puckered brow, and saying, `wonderful,’ and `most remarkable,’ at intervals, when the chance for an observation was given him. `What’s up?’ inquired the Rat, pausing in his labours. `Let’s have a look at them!’ cried the Rat, jumping up and running to the door. It was a pretty sight, and a seasonable one, that met their eyes when they flung the door open. In the fore-court, lit by the dim rays of a horn lantern, some eight or ten little fieldmice stood in a semicircle, red worsted comforters round their throats, their fore-paws thrust deep into their pockets, their feet jigging for warmth. With bright beady eyes they glanced shyly at each other, sniggering a little, sniffing and applying coat- sleeves a good deal. As the door opened, one of the elder ones that carried the lantern was just saying, `Now then, one, two, three!’ and forthwith their shrill little voices uprose on the air, singing one of the old-time carols that their forefathers composed in fields that were fallow and held by frost, or when snow-bound in chimney corners, and handed down to be sung in the miry street to lamp-lit windows at Yule-time. The voices ceased, the singers, bashful but smiling, exchanged sidelong glances, and silence succeeded–but for a moment only. Then, from up above and far away, down the tunnel they had so lately travelled was borne to their ears in a faint musical hum the sound of distant bells ringing a joyful and clangorous peal. Here much muttered conversation ensued, and the Mole only heard bits of it, such as–`Fresh, mind!–no, a pound of that will do– see you get Buggins’s, for I won’t have any other–no, only the best–if you can’t get it there, try somewhere else–yes, of course, home-made, no tinned stuff–well then, do the best you can!’ Finally, there was a chink of coin passing from paw to paw, the field-mouse was provided with an ample basket for his purchases, and off he hurried, he and his lantern. There was no more talk of play-acting once the very real and solid contents of the basket had been tumbled out on the table. Under the generalship of Rat, everybody was set to do something or to fetch something. In a very few minutes supper was ready, and Mole, as he took the head of the table in a sort of a dream, saw a lately barren board set thick with savoury comforts; saw his little friends’ faces brighten and beam as they fell to without delay; and then let himself loose–for he was famished indeed–on the provender so magically provided, thinking what a happy home-coming this had turned out, after all. As they ate, they talked of old times, and the field-mice gave him the local gossip up to date, and answered as well as they could the hundred questions he had to ask them. The Rat said little or nothing, only taking care that each guest had what he wanted, and plenty of it, and that Mole had no trouble or anxiety about anything. The weary Mole also was glad to turn in without delay, and soon had his head on his pillow, in great joy and contentment. But ere he closed his eyes he let them wander round his old room, mellow in the glow of the firelight that played or rested on familiar and friendly things which had long been unconsciously a part of him, and now smilingly received him back, without rancour. He was now in just the frame of mind that the tactful Rat had quietly worked to bring about in him. He saw clearly how plain and simple–how narrow, even–it all was; but clearly, too, how much it all meant to him, and the special value of some such anchorage in one’s existence. He did not at all want to abandon the new life and its splendid spaces, to turn his back on sun and air and all they offered him and creep home and stay there; the upper world was all too strong, it called to him still, even down there, and he knew he must return to the larger stage. But it was good to think he had this to come back to; this place which was all his own, these things which were so glad to see him again and could always be counted upon for the same simple welcome.